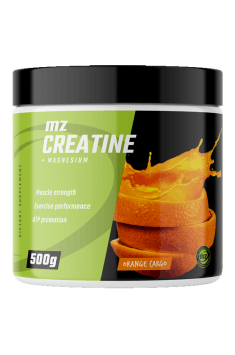 MZ-Store Creatine Monohydrate is the leader of dietary supplements in the form of powder with the best-quality guaranteed by the recognized brand of the manufacturer. It is an effective agent that improves exercise capacity and enables achieving training goals faster, whereas its use can be recommended to athletes of all disciplines with a short duration effort. Creatine is undoubtedly the most popular and the most commonly used supplement that increases the body's performance. Creatine has gained high recognition as a result of numerous scientific research confirming its effectiveness and even greater positive feedback of the users. The effectiveness of creatine is not surprising, because it affects one of the main energy mechanisms of the system. 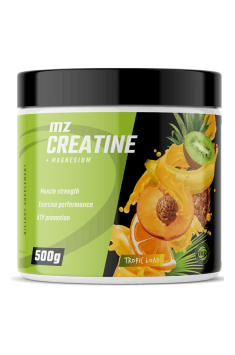 By adding other aspects of creatine’s activity conducive to the increase of muscle mass and the improvement of performance, we get an extremely comprehensive and yet safe dietary supplement. The effectiveness of creatine supplementation results mainly from the delivery of a substrate for phosphocreatine re-synthesis. This molecule is used in the human body to regenerate ATP and is the dominant source of energy in short-term efforts (the only one in the very first seconds of the effort). The increased supply of creatine improves this mechanism, promoting the acquisition of energy at the cellular level. This directly leads to better physical performance. The optimized energy metabolism allows more efficient muscle work. The above-described creatine activity improves exercise capacity, which is the first mechanism that increases the rate of muscle anabolism as a result of taking this supplement. By allowing performance of more intense training, it facilitates the generation of stronger stimuli for the development of muscle tissue, as well as the increase of muscle strength. 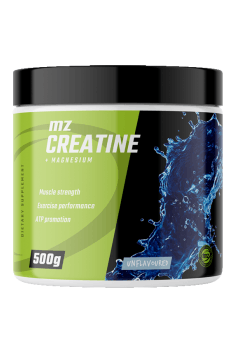 Muscle-Zone Creatine Monohydrate also shows the ability to increase cell hydration. Some people explain that the result of this activity is an increase in the size of the muscle, indicating that the discontinuation of creatine supplementation will cause loss of water from myocytes and, consequently, decrease in muscle size. This is not the case, because the increased hydration of cells does not only correspond to the increased cellular volume due to the inflow of fluids but it is also a necessary factor in relation to muscle hypertrophy. Promotion of cell hydration leads to the optimization of the biochemical environment. It is indicated that this results in the stimulation of mitogen-activated protein kinases (MAPK), which promotes the differentiation of myocytes. This is another aspect of creatine activity that causes the increase of muscle anabolism. Another mechanism responsible for the anabolic properties of creatine is its ability to reduce myostatin activity. These are proteins limiting the processes of muscle tissue growth. Their suppression reduces the factor that limits anabolism, thus allowing for an even higher rate of hypertrophy. The beneficial effect of creatine on energy metabolism at the cellular level is also mentioned as the probable cause of the promotion of osteoblast activity in the human body. Although this aspect of creatine effectiveness requires a more detailed study (the second possible cause of activity towards osteogenic cells is higher creatine kinase activity), supplementation with creatine is indicated to have a favorable influence on bone structure. Although not directly, the intake of creatine may promote the occurrence of the methylation process, whose high efficiency has a positive effect on energy metabolism and cardiovascular health as well as the functions of the nervous system. The synthesis of creatine in the human body requires the presence of methyl groups, which are obtained from S-adenosylmethionine. Creatine supplementation reduces its production in the body, which allows for saving SAMe and using it in other reactions. Therefore, taking creatine may, among others, lower the level of homocysteine, an amino acid whose high concentration is noted as a factor in the development of cardiovascular disease. It is indicated that the ability of creatine to maintain adequate levels of ATP in the cells of the nervous system prevents the accumulation of calcium ions that lead to damage to neuronal cells. In addition, according to some sources, supplementation with creatine may favorably influence cognitive functions and reduce the symptoms of depression. In conclusion, Creatine Monohydrate MZ-Store is an extremely effective supplement that allows to significantly increase the rate of anabolism. A multi-faceted mechanism of supporting hypertrophy makes creatine the undisputed leader among diet nutrients that promote the building of muscle mass and increase of strength. In addition, numerous scientific studies indicate that it is not only safe but even shows pro-health properties, whereas the reputation of the manufacturer guarantees the highest quality of the product. Take one serving (5g) mixed with 250ml of water before or after training. Take one portion (5g) mixed with 250ml of water. The current state of scientific knowledge about creatine denies the reasonableness of framing the creatine supplementation in cycles. Similarly, there is no need for a "charging" phase characterized by particularly high doses of creatine. When taking creatine, it is worth paying special attention to ensuring the right amount of water. Insufficient hydration during the creatine supplementation gives symptoms in the form of painful stomach cramps. Consider adding beta-alanine supplements. This, in combination with creatine, will create a comprehensive supplementary support for exercise capacity. Due to the dynamic development of the brand Muscle-zone, thereby increasing desire to meet the needs of people running a healthy and active lifestyle, we enriched our offer of sportswear (including specialist clothing), cosmetics and sports accessories, such as water bottles, shakers and pill boxes. All these accessories have our new logo and the slogan "To be in the Muscle Zone", which constitutes a kind of personal mission statement of each of our clients. However, to further meet their expectations, this time regarding healthy nutrition, we also introduced the phenomenal coconut oil by brand Soncone, having an amazing nutritional and care properties, and thus a very wide range of applications. Creatine Monohydrate Orange: creatine monohydrate, Aquamin MG, orange flavor, citric acid, sucralose, acesulfame, beta-carotene. Creatine Monohydrate Tropic: creatine monohydrate, Aquamin MG, tropical fruits flavor, citric acid, sucralose, acesulfame, beta-carotene. Creatine Monohydrate Unflavored: creatine monohydrate, Aquamin MG.
Formulations stimulating the secretion of growth hormone. Contains GABA, pyroglutamate arginine and L-lysine. The best absorbable form of choline. Improves mind efficiency and positively affects the cognitive functions. Helladrol increases strength, power, endurance, muscle hardness & definition. EPI s an active hormone which does not require any conversion, with a structure similar to dihydrotestosterone.